Because we are in the design profession, we are exposed to building materials day-in & day-out. This is good and bad. Good because it keeps us aware of new products on the market, but also bad because we realize our options are endless, and neither Brian nor I claim to be very decisive. 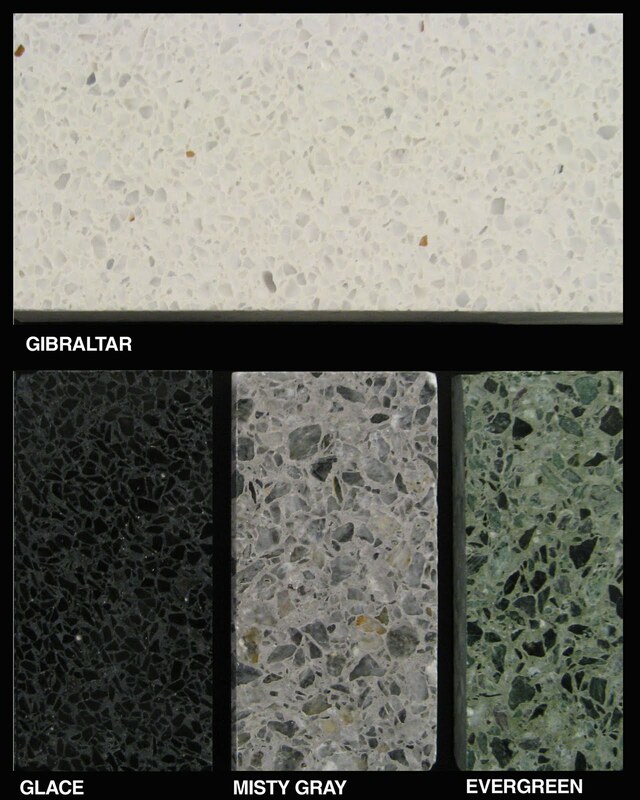 Which leads me to the countertops for our kitchen. We've known all along that we wanted a dark gray surface for our countertops, and originally it was pretty clear that we wanted a solid, consistent surface. However, after much deliberation over the flooring for this room, we've decided that we want to go with slate (99% sure). I had tossed around the idea of a terrazzo flooring, but because the cost was almost triple that of slate, that decision was quickly tossed out. 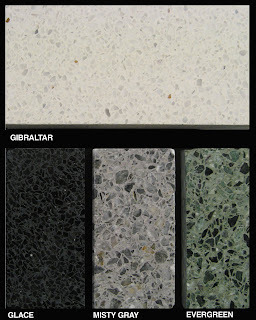 BUT, then we realized that we could get a similar terrazzo-type slab for the countertops. The product is called Eco-Terr, and it is "made of recycled natural stone aggregates. Durable, zero VOC materials, non-porous cleanable finish does not support microbial growth... contains pre-consumer recycled content" (according to http://www.coveringsetc.com/). We contacted our reps at one of our favorite companies, CaraGreen, and they sent us samples of various colors. Although none of them are 'dark gray', we have shifted our opinions slightly, and are leaning towards the Misty Gray or the Gibraltar, below. The black is too black, and the green too green. Let us know what you think! I love the Misty Gray!